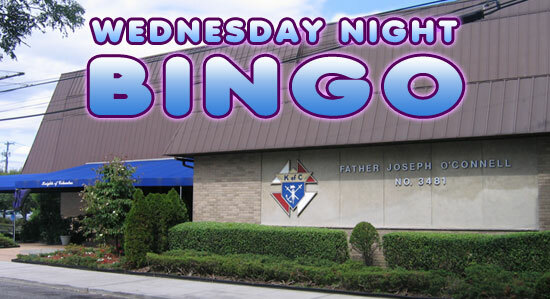 For over 48 years, we have are operating our Knights of Columbus Bingo every Wednesday Night. It is at Father Joseph O'Connell Council located at 2985 Kenneth Place in Oceanside, Long Island. Our friendly and professional Knights of Columbus and Ladies Auxiliary staff will assist you for your bingo game packages after 6PM in the building. We begin our Bingo games with a "Share the Wealth Black" at 6:45 PM followed by a "Share the Wealth Yellow" at 7PM. We also have those fun "Bell Jars" games of chance and "BONUS BALL" BINGO for your enjoyment for sale prior to that game starting at 6:45pm. All of our customers enjoy our spacious, comfortable climate controlled building and luxurious facilities. Its like being in fancy Las Vegas bingo hall, but locally here for you! So if you want to have some fun one Wednesday night with friends or family, come on down early and give us a try and we will set a table for you to enjoy the games and have fun! Proceeds from our Bingo help fund our local charities and Catholic relief organizations nationally and worldwide. We always need more players and volunteers. For additional information contact Tom Feely at 516-255-7075 or tfeely@hotmail.com. 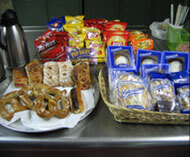 Our food and refreshments are prepared to your enjoyment. 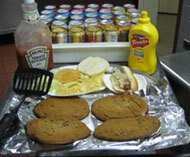 We offer for sale fresh pizza after 8:00pm, snacks and coffee, soda and chips. We sometimes have food prepared but menus change weekly depending on the season and demand. The first game begins promptly at 6:45 PM share the wealth black (First ball of first game is drawn). 7:00 PM share the wealth yellow. In accordance with NYS Rule No. 5820.8, only ONE ADMISSION card can be purchased, per player. Every person entering the bingo hall, including minors, must purchase at least an admission card. No person shall play more than one admission card. No children under the age of 10 shall be admitted to our bingo hall. Children shall be accompanied and controlled at all times by a responsible adult. No seats can be saved using bingo cards, daubers or other items. Reserved seats for A.D.A. upon request. Bingo cards are sold randomly; players shall not select their own cards or packages. Bingo cards shall be exchanged only in the event of defect caused by the manufacturer. Regular bingo is a game that can be played using a face-card included in admission package. Special games must be played on a separately purchased card. No ball is official until the letter AND the number has been announced by the caller. A call of bingo will be honored and the winner paid when both the letter and number of the ball drawn have been called. 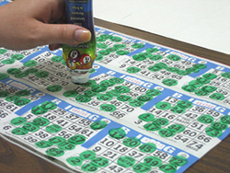 A player does not need to bingo on the last number called to be eligible for a prize. The flash-boards are a convenience to our players. Winning cards will be verified by the Caller's comparison of the numbers appearing on the balls drawn and called with the numbers read back from the player's bingo face-card by the floor checker. If there is a discrepancy between a number appearing on a ball drawn and a number appearing on the flash-board, the number on the ball drawn is official. It is the winning player's responsibility to stop the game by raising his or her hand and calling out "BINGO"	loud enough to be heard by floor checkers. If a player wins two parts of a multiple-part game (i.e., a letter T and a Round Robin) on the same number called, that player is entitled lo both prizes, without another number called. Disorderly persons (any behavior disturbing to the other players) will be asked to leave the premises. The paper they are playing will be declared void and no prizes will be paid on that paper. A pro rata refund may be offered at the discretion of the members in charge. If a power outage occurs prior to the halfway point of the bingo occasion, we will attempt to refund each player half price for their bingo cards. If the outage occurs after the halfway point, the occasion will be considered over, and no refund will be offered. On any given evening, a minimum of 85 players is required in order to conduct normal bingo operations. Attendance by less than 85 players may result in prizes for that session being reduced and the possible cancellation of Progressive Bingo for that evening. All of our workers are volunteers and are conducting these bingo games solely to raise money for our organization's lawful purposes. Our volunteers are prohibited from participating in the games in any way. Please do not ask. them to watch your cards. All problems, questions and/or disputes will be resolved by the Members in Charge. Their decision, made in accordance with NYS regulations and published house rules, will be final. The lounge is not a part of the bingo premises. Its use is restricted to members of the Knights of Columbus. Admission is $4.00 which includes 3 game face cards on all games except early-bird and progressive games. Additional card prices - all games (excluding early-bird and progressive games).